That’s up 53% over its three-day 2016 event, the company said. 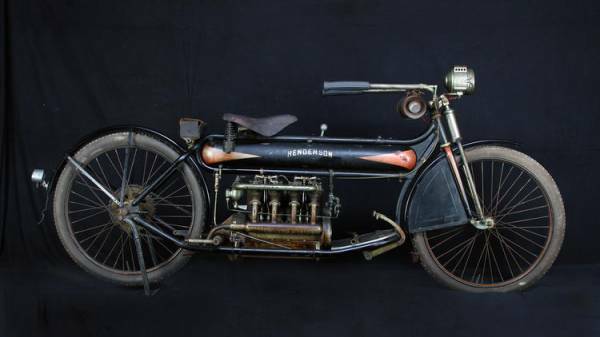 The top Mecum seller was a rare, unrestored 1912 Henderson Four antique motorcycle, which went for $490,000, plus buyer and seller fees. Antique motorcycles led the sales chart. Also moving with big numbers were a pair of 1913 Henderson Fours (at $150,000 and $127,500), a 1928 Excelsior hill-climber (at $117,500) and a 1949 Vincent Black Shadow (at $110,000). A 1923 Indian Chief, purportedly once owned by Steve McQueen, went for $100,000. European motorcycles did less well. The highly anticipated Guy Webster Italian collection, covered here in an earlier story, underperformed. While three vintage MV Agusta bikes went for an average of $30,000 each, and two FB Mondial race bikes sold for slightly more than that, a pair of rare Ceccato Grand Prix motorcycles failed to reach their reserve prices and were not sold. Original news article can be found here.